As many of you know, this Summer we welcomed Sheffield City Council on board as a Regional Partner. What you may not know is the extent to which that relationship is part of a much broader discussion about how we, and others, can combine forces to help push forward digital agendas across the city: in skills, health, infrastructure, the economy, local government services – everywhere that digital technology is having a significant impact on the lives, and life chances, of the people of our fair city. These conversations have now begun to solidify around the concept of a ‘Digital Coalition’ for the city – a broad group of people and organisations, representing different areas of expertise and concern, who share collective interest, and some responsibility, for developing the city’s digital capabilities in particular domains. The intention is that it would be self-selecting (i.e. people can join and leave it as they wish), and that groups within the Coalition would share common ways of working and sharing information, both with each other and publicly, about what should and is going on in each of the domains. There is a strong ambition for Sheffield to be a leading Digital City which supports individuals and business to thrive in the Information Economy. BUT, there is no agreed narrative about what this means, what Sheffield’s focus in the Information Economy is, nor is there clear city leadership (that’s not just the Council) on this. HOWEVER, there is a thriving digital community in Sheffield doing awesome things across the creative sector, digital skills and inclusion, and a huge will to make the ambition real. THEREFORE, we need to get some coordinated focus on amplifying the digital activity already happening in Sheffield so we can move the city off the cusp of a digital boom into the middle of one. We are currently sketching out the details of this, and there is still a lot of work to do. But we also want many other people to contribute to it, help us to shape it and join the coalition to make it happen. 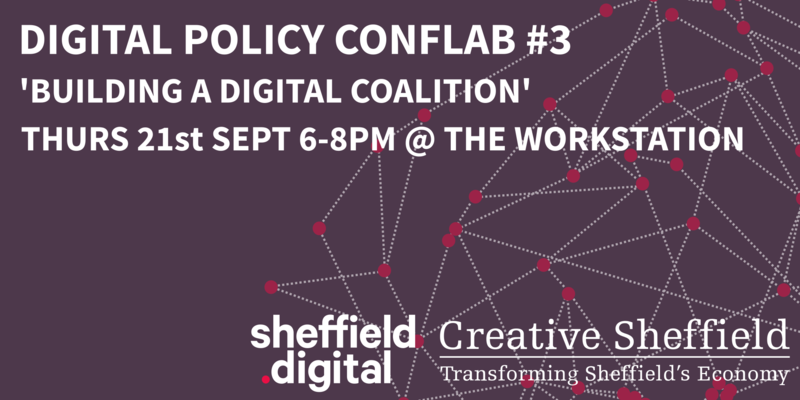 This Conflab is just that – a chance for the digital and tech community in Sheffield to find out what’s going on, ask questions, contribute suggestions and get involved. It will be held on Thursday the 21st September from 6pm in the Creative Lounge at The Workstation, in conjunction with Creative Sheffield, the economic development arm of Sheffield City Council. We are also aware that there have been many workshops and consultations about the city’s approach to ‘digital’ stretching back nearly twenty years (several of which we have personally been involved in! ), and that despite good recommendations there has historically been little follow up. Is it different this time? It certainly feels different. For one thing, the Council is clearly placing a new emphasis on the importance of digital to transform the lives of citizens, and this is reflected in the remit and activity of Mark Gannon who recently joined SCC as Director of Business Change and Information Solutions, and the close involvement of Councillor Olivia Blake, who is both Cabinet Member for Finance and the Council’s Deputy Leader. 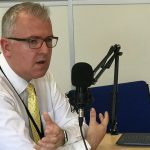 You can hear us talk to Mark about the Coalition on episode two of the Sheffield Digital Podcast. Also, while the Coalition will only be successful if it identifies priorities and delivers on them, we see this as a shared ongoing process that needs to be nurtured, encouraged and continually communicated about, rather than a consultation that produces a strategy and leaves the Council with the responsibility of implementing a set of recommendations. We think this approach is a lot smarter, and has the potential to set Sheffield apart from other places. Last year Sheffield was ranked as the 10th ‘Smartest’ city in the UK in Huwei’s UK Smart Cities Index. Our ambition is for the city to now build on that ranking and reputation by helping to combine the resources and efforts of those people and organisations who want to make a difference. Mid-September: produce an outline / presentation / briefing paper explaining how the Digital Coalition could work and how it’s governed and organised. September 21st: Host a Digital Policy Conflab to bring in opinions and encourage discussion on the concept and how it’s articulated. October: Begin to firm up narrative and build coalitions in the city domains. Early November: Run a city-wide Digital Conference to bring the Coalition and sub-communities together to meet and present the current initiatives and progress across the domains. End of the Year: Have the Digital Coalition, its operating parameters and narrative fully formalised and in place. We will be publishing the framework sketch before the event, and will also circulate a short briefing paper to provide background information and frame the discussion a few days before the event itself, so everyone who attends can be up to speed and able to more effectively feed into the debate. All points of view will be respected. This is an informal event and will not be officially minuted, although notes will be taken to feed into the Digital Coalition plan. The meeting is free to attend, but please do register your interest so we have an idea of likely numbers.